You've been through SlipSpace and returned to tell the tale. Let 'em know. This shirt is a +1 Fame modifier. The Players/GMs Screen is ready! Now available in Hard Card Inserts or PDF format. With one side for Players and one side for GMs, this screen is designed to speed your DayTrippers games with handy tables for all common events and actions. Invent your own planets, stars, lifeforms and missions on the fly! These tables are powered by a set of PHP objects representing generators from the DayTrippers GameMasters Guide, called by a master script which randomizes all values each time the page is loaded. Excerpted from the DayTrippers GameMasters Guide, the tables in this Generator will assist in creating a wide variety of random Alien Lifeforms for any science fiction roleplaying system. 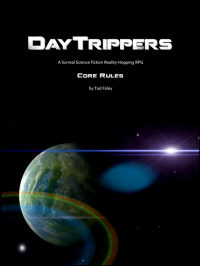 Excerpted from the DayTrippers GameMasters Guide, the tables in this Generator will assist in creating a wide variety of random Locations for any Earthlike planet, and any science fiction roleplaying system. 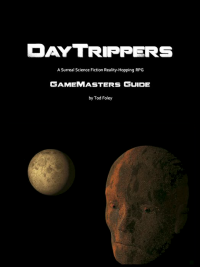 Excerpted from the DayTrippers GameMasters Guide, the tables in this Generator will assist in creating a wide variety of random Stars and Planets for any science fiction roleplaying system.